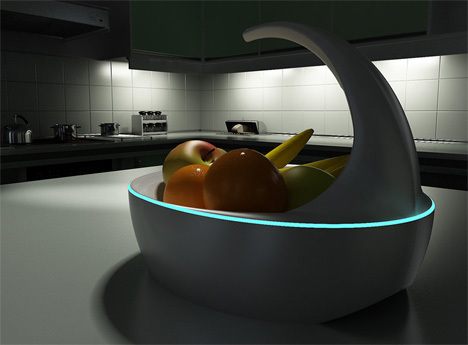 The BLUE Bowl fosters freshness with a UV blue wavelength light that shines from a faucet-like contraption that spurts out of the side of the bowl. UV light waves have been proven to inactivate certain types of bacteria responsible for mold and gasses that accelerate the rotting process. With the help of the BLUE bowl’s cleansing light, your fruit can stay fresher, and more sanitary, for longer. This appliance could be installed anywhere with plumbing and an open corner. It has a rotating, swiss-army-knife type apparatus and functions as a full bathroom; the toilet remains in place at the bottom, while storage bins can swivel back and forth above it which in turn reveals two shower heads. Designed for petite urban apartments, the Vertebrae bathroom unit costs $15,000 and can be bought in a variety of colors. A pun taken perhaps a few steps too far, these speakers are lodged in statues that looks like headless German shepherds. Each order comes in sets of two either black or white dogs outfitted with polyester, 180-watt speakers and costs just under $1,500. This gadget may stretch the definition of an appliance, but only in order to stretch the boundaries of chill. Invented by Barry Lai Yin Lock for the NextGen PC Design Competition, this waterproof PC is made from low-density waterproof plastics that naturally float at the water’s surface. It’s also solar-powered, making it possible to use without ever worrying about plugging it in. It’s cooled by the water it floats in and has a touchable user interface that removes any need for a keyboard. It can be attached to pool rings or inner tubes and is equipped with GPS, Bluetooth capabilities and can access the internet. This device might be absurdly specialized for something that’s generally made by people that don’t care enough to make something better, but if you are passionate about hot dogs you may be in love. The Hot-Dogger toasts hot dog buns and roasts weenies in one toaster-like movement. No need to multi-task; Hot-Dogger is your one-stop shop when it comes to hot dog preparation. Admiral Tele-bar might be this writer’s favorite home appliance on the list. Invented in the mid-20th century, the the combination television, record player, mini bar created by Admiral was truly “one and only.” It boasted a “Triple-Play” Phonograph and exquisite cabinetry that included a stainless steel mixing tray, a liquor-proof serving shelf, an ’empties’ receptacle, and racks for 32 glasses. Its lower compartments held over 30 bottles and the entire set could be purchased with glasses included at no extra charge. This is an interesting idea that also dates back to the mid 20th century and regrettably never took off; a refrigerator and freezer that keeps your food at eye level sounds handy and enjoyable to me, though I guess everything you’d keep in higher cabinets would then have to be relocated to lower storage areas anyway… either way, it would make for a fun option. Thought up in the 1930’s, this refrigerator-radio can’t help but remind the tech news-follower of Samsung’s recent release of a refrigerator that was also a sound system and TV. Apparently people have been trying to pitch food storage/entertainment hybrids for almost a century.